It’s kind of like how a runner practicing for a competition wouldn’t just run a lot. They would follow a schedule and do drills, sprints, lift weights, stretch, record their times, eat healthy foods, etc. 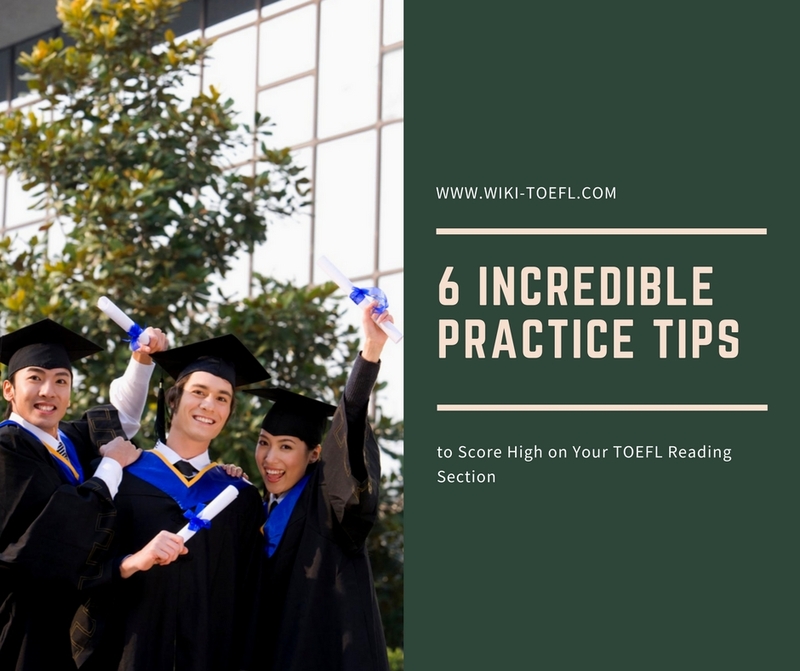 So to help you pass the reading section of the TOEFL test, we have six important tips that show you how to practice reading. No matter which format you take, the TOEFL tests your skills in non-technical English reading materials. This means that you don’t need special knowledge in any field to understand the readings. The goal of the exam is to assess your English comprehension and your vocabulary. Now that we know what we’re studying for, let’s check out these practice tips! The only way to improve your reading practice for the TOEFL test is by actively reading. Try to read at least 20 minutes every single day during your preparation time using articles, books and stories. A variety (mix) of different materials is best, so here are some types of materials to try. At least three times a week, read news articles in English. This might mean one or two articles per study session, depending on the length of the article, the level of difficulty and your reading speed. Breaking News English has some excellent articles for English learners. You can select articles according to your level. After each reading, you will find a variety of questions to check your understanding. Answer these questions by referring to the text you’ve just read and then check your answers. To understand your mistakes, read the text again to find the correct answer. For more news articles, visit Literacy Net for their CNN stories modified for English learners like you. On their website, you will find an outline for each news article. Read these outlines first to help you to understand the article better. Besides reading news articles, read some short stories too. The Eserver’s Collection – Fiction website has a nice selection of short stories written in easy English to help learners. Read at least one short story a week. Summarize each story either in writing or verbally after reading. A few weeks later, reread a short story and you will notice your progress. It’s a good idea to find a great book in English which you can understand. Goodreads also has a long list of recommendations for ESL learners to choose from. Read the short summary of each book or story first to see if it’s interesting. If it’s not interesting to you, find something else. If you are interested in what you are reading, it’s much easier to focus. When you are reading a book like this, try to read a chapter or two per week. Split up the reading to a few pages every day. Stop after each page and summarize what you’ve read. Circle the words that you don’t understand, and look them up in the dictionary when you get to a good stopping place—like the end of a chapter. After each chapter, summarize the chapter in writing or by speaking out loud. Remember, if you don’t have anyone to talk to, you can still summarize it out loud speaking to a mirror. You could even record yourself. Fun magazines, comics, Facebook posts or blogs are great for passive reading. Passive reading is when you read something in English without a learning objective (goal) in mind. GoComics is a fun website full of popular up-to-date comics, including Garfield, Snoopy, Dilbert, Get Fuzzy and Pickles. Garfield Minus Garfield is one of my favorite websites using Garfield comics without Garfield. If you love wellness and nutrition, MindBodyGreen, Tiny Buddha and Collective Evolution are awesome resources, full of short articles on health and healing. If you love traveling, you may want to check out The Travel Magazine, Matador Network or Travelettes. If you are a fitness or exercise lover, Self, Men’s Fitness, Runner’s World and Shape may be for you. I suggest you subscribe to your favorite magazines, authors, bloggers, athletes and actors via Facebook to read their updates in English. You should also add these sites to your “favorites” or “bookmarks” bar so that they’re easy to access. And remember to read all this for fun. Don’t worry about summarizing or using your dictionary. The purpose of passive reading is to allow your brain to get used to thinking in English. There is no minimum or maximum timeframe to practice passive reading; just fill your free time with English materials. Building up your vocabulary is very important to understand more of what you read. Here are a collection of tips and ways to strengthen your vocabulary while studying for the TOEFL test. When you find a new word, first try to guess what it means. Look at the context in which the word is used—the sentences around it. Try to figure out the meaning of the word based on what’s happening in the text. Once you have your guess, then check your dictionary. There are words that appear in TOEFL tests regularly. These are words that are also frequently used in real life. Focus your vocab study on these words to better understand your TOEFL readings. Study your vocabulary with a TOEFL course, that specializes in teaching English students how to prepare for this exam. This course is meant to help you study independently and learn more about what’s on the TOEFL exam as you improve your English vocabulary and grammar. You can use a thesaurus to find the synonyms and antonyms of each word. This will help you grow your vocabulary faster. Instead of learning just one new word, you can easily learn five: three synonyms and two antonyms, for example. To remember your synonyms and antonyms, first use your original word in a sentence. Then make the same (or similar) sentence with several synonyms. Finally, change the sentence to make sense with an antonym. Here’s an example with the adjective “dynamic,” which means to have lots of energy or to be active. My dynamic choir teacher was jumping around while flailing his arms in class today. My energetic choir teacher was jumping around while flailing his arms in class today. My lively choir teacher was jumping around while flailing his arms in class today. My lifeless choir teacher would never jump around in class. My inactive choir teacher slept with his head on the desk in class today. Instead of “regular” flashcards with a word’s definition on the back side, write the word’s synonyms and antonyms on the card. For constant practice, write new TOEFL vocab words on sticky notes and post them around your house: on your mirror, your door, your fridge, etc. You will see a vocab word anywhere you go. If you still need to practice basic, everyday English vocabulary, you can use Vocabulary Stickers to get you started with over 130 English words. Whenever you see a sticky note, read the word aloud, check its meaning and then use the word in a sentence. Be sure to make sentences of your vocab words both in writing and speaking. Challenge yourself to write five different sentences for each word. Even better, write a short story or speech every week on a topic you are passionate about using that week’s new words. You could also do crossword puzzles and word searches to learn some words. You can create your own online for free using your new vocabulary, or play pre-made crosswords online. The TOEFL is a timed test. You have about five minutes for each passage and one minute for each question. This means that it’s important to improve your reading speed. To read faster, first you will need to see where you are at. Read a passage (a paragraph or a page) and time yourself. Write down how long it takes you to read an average passage, with today’s date. Another way to record your current speed is to set a timer for five minutes and start reading. See how much you are able to read in five minutes, and write down this information. Reading often and following the other tips in this post will increase your reading speed. Time your reading speed each week using the same book or source. Stop when the time is up and write down your results. Over time you will be able to see your reading speed get faster. You can also do the reading section of a practice TOEFL test and time yourself. How long does it take you to finish the reading section? Depending on how many months you have to study, do the reading section of a practice TOEFL test every two weeks or every month and record how long it takes you. Use this information to plan your TOEFL study time. You should also take a full practice test with a TOEFL preparation resource like ScoreNexus. ScoreNexus lets you take a full exam, with all the same rules and time limits as the actual TOEFL exam, and then has your work reviewed by a professional English teacher. This professional will give you a real score and give you advice about how to improve your score. Finally, you can read faster if you learn to stay calm. If you are nervous, it may take you longer to read a paragraph or your understanding level may be lower. But if you are calm, it will be easier to relax. So stretch, relax your body and take a few deep breaths before each reading practice. You may believe that you have to understand every single word in every passage you read. The good news is that you don’t. The most important is that you understand the main ideas and most important points within each paragraph. At least three times a week, read for the main idea—not the details. Scan the text for meaning, and look for keywords, action verbs, names, connective words and any other words that stand out. This is what you will have to do on the test. Highlight or circle words and ideas that stand out. Make side notes of the main points, characters and vocabulary. During this type of practice (and on the test), if you don’t understand something, just move on. As you continue reading you will gain more clarity and will understand the main idea of the text. Some of your readings, like the articles from Breaking News English for example, may include some questions at the end. If you don’t know the answer to a question, take your best guess. Eliminate the answers which are certainly wrong, and choose from the remaining options. Listen to your intuition (feeling, instinct) and circle what seems to be the best answer. Move on quickly to the next questions without worrying about your answer. Once you review your answer, you can reread the text and check with your dictionary for more clarity. This will really help you prepare for the TOEFL, when you won’t have much time to think about your answers. Working with a teacher or a study partner will make your study time less lonely. They can help clarify your questions, keep you motivated and quiz you. You can find study partners or teachers through MeetUp, Couchsurfing, Facebook, italki, Craigslist and BuddySchool, for example. If you don’t live in the same town, you can connect via Skype and email. Here are a few more ideas about how to use teacher or study friend. One way to use a study partner is to have a book club. Meet biweekly or monthly to discuss the story together as you read. If you can’t find an existing book club, make your own. Post an ad on a bulletin board in your town, local schools or at work, or on the sites mentioned above. Select the same reading material as your study partner or teacher. Sit down and read it together, or agree on a due date when you need to finish reading it by. Can you describe the main characters? What was the main idea of the reading/third paragraph/etc.? What do you think about the ending? / How would you end the story differently? If you could get a coffee with one character from the book, who would you pick? Why? What would you ask him/her? Can you relate to the story, and if so, how? Test each other by creating small quizzes for one another, each based on a short reading. You can use multiple choice, fill in the blanks, true or false, and finish the sentence questions. Create the short quiz on your own, and then swap with your partner when you meet. You will also need to give them a copy of the article or passage your quiz is based on. After you each read your partner’s article and take their quiz, correct each other’s mistakes—but always remain positive. Don’t just point out what’s incorrect. Also remind each other what you are doing right and what you have improved on since the last study session. Most importantly, don’t forget to motivate and encourage each other as well. If you use these tips to practice reading effectively (and often! ), there is no doubt that you will become a better and faster reader. Keep working hard, and I know you will pass the reading section of the TOEFL test!